Harvard Sweet Boutique Inc., founded in 2007, offers a variety of mouth-watering treats for any occasion made from only the finest and freshest ingredients. Their brownies, cookies, truffles, bars, and toffee are made completely from scratch and will make the perfect Christmas gift for your friends and family this holiday season. I was excited when my Harvard Sweet Boutique treat boxed arrived; each cookie, brownie, and bar was individually wrapped and labeled so I knew exactly what I would be trying. Additionally, since my daughter has an allergies to cashews, I was pleased to learn that no cashews are used in any of the treats that Harvard Sweet Boutique makes. There is a note at the bottom of their website that says that anyone who places an order on their site will have to let them know if there is an allergy, so I would definitely feel comfortable ordering something from them again. 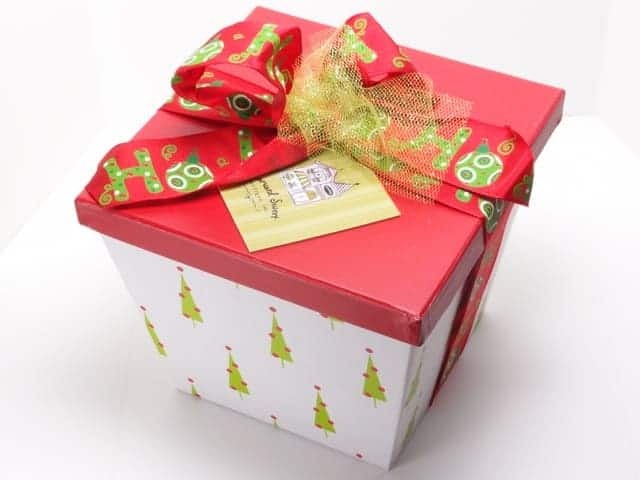 Harvard Sweet Boutique, Inc. is available for wedding and events (check out their wedding centerpieces and party favors) and will also put together business gifts for your corporate needs. They also haven’t left out those with dietary needs; a variety of treats are available gluten-free as well as low carbs. I had a hard time choosing which treat I wanted to try first, but I finally chose the Milk Chocolate Almond Toffee. The caramel is the perfect balance between too hard and too soft; it didn’t get stuck in my teeth, and I loved it for that. The next time that I’m in the mood for toffee, I will be wanting Harvard Sweet Boutique. I don’t think you could go wrong trying any of the cookies offered by Harvard Sweet Boutique. The Peanut Butter Chocolate Chip Cookies were my favorite; they were thick, soft, and sturdy. Half of the cookie was dipped in chocolate, which I loved! My second favorite was the Chocolate Toffee. The toffee added just the right amount of “crunch” to the cookie. These were not as thick as the Peanut Butter Chocolate Chip Cookies, but they were still perfect. I actually didn’t get to try any of the Ginger Molasses Cookies; my husband ran off with both of them, with the understanding that he would have to tell me exactly what he liked (or didn’t like) about them. He’s pretty picky about cookies, but these passed the test. He liked them because they weren’t too sticky. The Coconut Cookies were my least favorite of the cookies that I tried, but this is a personal preference. I do like coconut, but I felt that the cookie was too saturated with it. This cookie was lighter and airier than the others, but it did taste great. For me, personally, it’s just not something I would order again. I love fudge and I love mint! The Mint Fudge Brownies were everything I could hope for, but they are really rich. I definitely recommend having a glass of ice cold milk nearby when trying out this brownie. If you can’t finish it all in one sitting, that’s okay, too! That means the amazing treat will last even longer. I loved the Vanilla Sea Salt Caramel Brownies! They reminded me of one of my favorite Starbucks drinks. The caramel in these brownies are really soft and gooey, which is how I make my own caramel. There is just something about the salt combined with the chocolate and the caramel that is one of my favorite flavors. I could seriously order an entire container of just these brownies and be perfectly content. The Chocolate Glazed Macadamia Caramel Shortbread Bars are scrumptious. They remind me of a treat that I make a few times a year–only the shortbread bars from Harvard Sweet Boutique are so much better. I never thought to add nuts to the treat I make, but they add an extra something to it. Connect with Harvard Sweet Boutique on Facebook, Twitter & Pinterest. Sometimes it is just nice to have someone else make awesome cookies to eat. I love butter cookies and shortbread cookies that come up during the holiday’s. Lovely review! I love cookies and brownies. I might have to check this company out. All of this sounds amazing! I love giving and receiving sweet treats as gifts! I enjoy your ideas. Keep them coming. The cookies look delicious! Ordering these would be great for someone who doesn’t have time to bake. The Mint Chocolate Fudge Brownies sounds divine. Those desserts all sound delicious! These sound really wonderful. The Vanilla Sea Salt Caramel Brownies really sound yummy and would be the first thing I would try. This would make a great gift for anyone. I’m intrigued by the Vanilla Sea Salt Caramel Brownies. I LOVE brownies and food with a sweet/salty taste. And I also love coconut but don’t care for coconut water. I had tried it b/c I read it was good for hydration but found it to be way too sweet and had to toss it. This website sounds so delicious! I like getting food items for Christmas! I like the cookie Peanut Butter Chocolate Chip Cookies! They look like they put their items in a nice box that can be sent to a loved one. I would love to order something here! Mmmm! 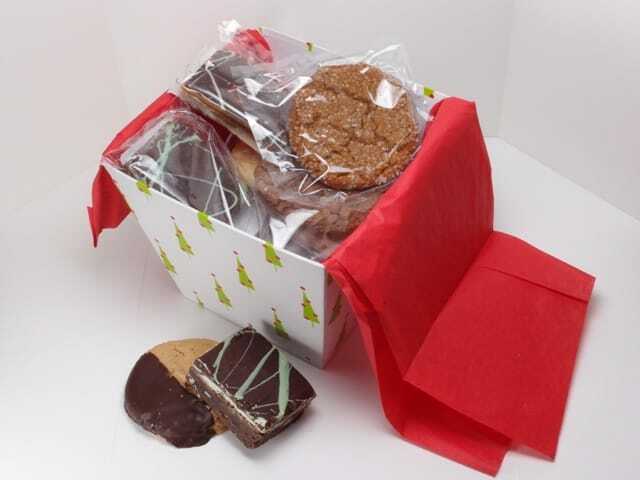 The treats look delicious – very cool idea for a holiday gift! These looks sooo yummy! They would also make great gifts I mean who wouldnt want these scrumptious goodies for Christmas? I know I wouldnt mind receiving some of the Peanut Butter Chocolate chip cookies! This would be great for my business associates and corporate clients this Christmas! Thanks for the recommendation! I may have to order some of those treats for my husband as a surprise. He LOVES peanut butter cookies, and your description of the peanut butter chocolate chip ones sound like something he’d love. And, of course, then I could steal some of the milk chocolate almond toffee for myself!